Under bridges and through locks is a great way to see a country. Photo © by Judy Wells. It took less than six nights to hook me on barging. La Renaissance. Photo courtesy European Waterways. 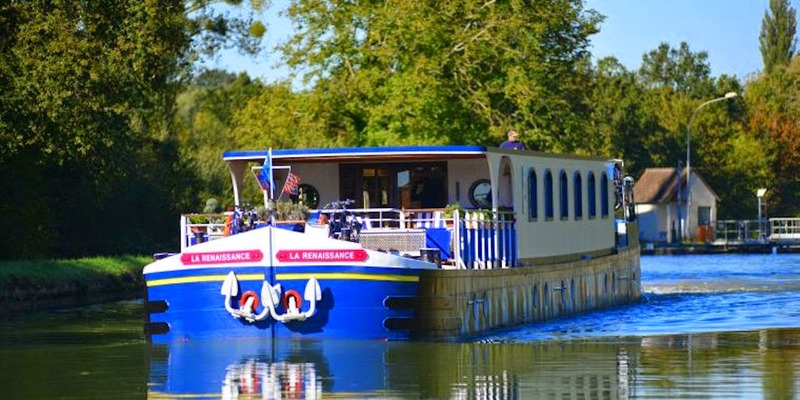 • That I was on European Waterways' La Renaissance, one of the most spacious hotel barge in its fleet, helped. Spring blooms were glorious. Photo© by Judy Wells. • That spring was in full flower in France's Loire Valley was enchanting. Hannah presents the wine. hoto© by Judy Wells. Isabelle introduces us to a new cheese. Photo© by Judy Wells. • That we were only four guests instead of the usual eight meant extra special service from the young, affable and competent crew. Montargis, the Venice of France. Photo © by Judy Wells. • That we eased through 800 years of French history and culture, seeing a few things thoroughly was most appealing. Rump of lamb. Photo ©by Judy Wells. • That Chef Luke prepared inventive, delicious meals that were accompanied by excellent wines and cheese certainly fueled my enthusiasm. Our activity, Sunning and relaxing. Photo © by Judy Wells. • That it was the perfect vacation for Levelers clinched the deal. Tip: There are steps aboard. You will have one and occasionally a short gangplank to get on or off the barge and 13 down to cabin level. There is a low cowling to get into the fore and aft cabins and a tiny step between the lounge and foredeck areas. One cabin is wheelchair accessible on the eight-passenger La Nouvelle Etoile, which primarily plies the canals of Holland in March and May, Burgundy in June and July and Germany and Luxembourg in September and October. There's also a wheelchair lift. Market at Briare. Photo © by Judy Wells. The pace of life aboard is perfect for most of us Levelers. Nothing except breakfast begins before 9 a.m. If we barged from one locale to another in the morning, in the afternoon we piled in the eight-passenger Mercedes van with driver/guide/deck man/captain-in-training Arnald for an excursion to a chateau/castle, medieval village, winery or other site of interest. If the change of mooring comes in the afternoon, we toured in the morning. Castles are the most challenging for us, thanks to steps, steps and more steps. 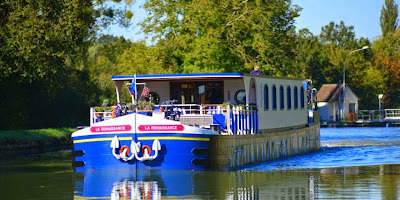 On the Briare Canal cruise we visited three. Adieux Courtyard, Fountainebleau. Photo ç by Judy Wells. The first challenge was Fountainebleau with its 138 acres and 1,500 rooms. Fortunately, we only saw the royal apartments and the major entertaining spaces. The cobblestone Adieux Courtyard, where Napoleon I said farewell to his troops before exile, is the first hurdle, definitely difficult walking. Next were the bathrooms, downstairs, of course, 23 steps if I counted right. From the 28 steps with three landings to the Napoleon I exhibit to the six steps up to the large apartments you will have flat surfaces to amble, stopping frequently to take in the rooms, their history and decor. Then it's 42 steps down and five steps up to Trinity chapel. Tip: There is an elevator but in France you have to have a special card to use them in historic buildings. If you qualify for handicapped parking, bring one of the hanging tags with you and show it when you buy your ticket. Might work. Chateau Sully sur Loire. Photo © by Judy Wells. The 11th century Chateau Sully-sur-Loire is considerably smaller and has a smaller cobblestone area, but is no less encumbered by stairs. Here it's 22 steps to the bathrooms and 38 steps to the first floor great hall and king's room. There are 60 steps to the top floor, but it is empty and I skipped that. Instead, took the 13 steps to the steward's office, 15 steps down to the Duchess's apartments, 10 steps up to the duke's chambers, 21 steps down to the great room, 23 steps down to the dining room and finally, two steps to reach courtyard level. Chaeau la Bussiere. Photo © by Judy Wells. Our third castle, Chateau la Bussiere, fondly known as the Fisherman's Castle and owned by only two families since the 12th century and still privately owned by the De Chassevals, was our favorite. Still with the steps though: six into the chateau, 26 up to the dining and living rooms, 13 steps down to the kitchen, eight to get to the entrancd and another six to reach the 18th century aromatic, vegetable, fruit and medicinal garden, part of the designs by Le Notre, the landscaper of Versailles. 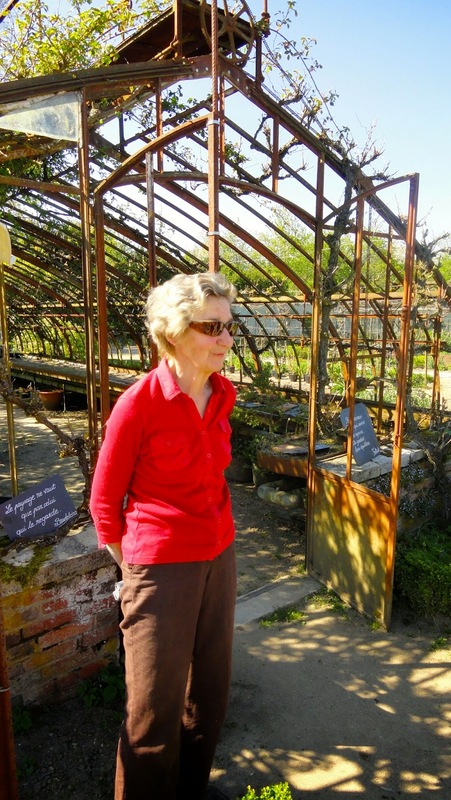 If you see a slender, silver haired lady working i the garden, that's Maria de Chasseval, Duchess of Sully. Maria de Chasseval, Duchess of Bussiere. Photo © by Judy Wells. 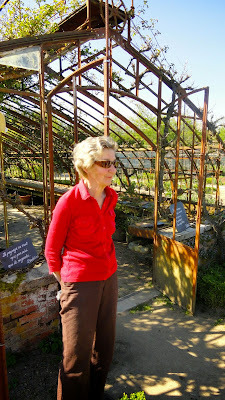 Tip: Our other excursions to markets, a winery and faience factory were much less strenuous. This was the first trip following a third hip surgery in October and I managed, taking advantage of chairs and ledges to sit whenever possible and taking it easy on board the barge the rest of the time. If it sounds too daunting, you can always opt to stroll about the grounds or skip the excursion altogether.There are always interesting towns and villages within a block or two of the barge. The view from the dock at Montbouy. Photo © by Judy Wells. For a day-to-day account of the trip on La Renaissance, go to Aboard Renaaissance at All Things Cruise. La Renaissance at Briare. Photo © by Judy Wells. Personally, I'm looking forward to doing a whole survey of barges and the countrysides through which they can take me.